3446. Edna M SMITH 1 (Jenny Maude BITLER , Sylvester VanTress , Daniel , Daniel , John , Johannes ) was born on 19 Oct 1905 in Belleville, Republic Co, KS. She died on 16 Feb 1993 in Los Angeles Co, CA. Edna resided in 1910 in Belleville, Republic Co, KS. She resided in 1930 in Belleville, Republic Co, KS. She was issued a social security number . She resided on 3 Aug 1931 in Belleville, Republic Co, KS. She resided in Apr 1935 in 325 Main St, Evanston, Uinta Co, WY. She resided in 1940 in 325 Main St, Evanston, Uinta Co, WY. She resided in 1943 in Maywood, CA. She resided in 1948 in 4701 E 58th St, Maywood City, Los Angeles Co, CA. Edna married Clifford George GEWECKE, son of Henry J GEWECKE and Dorothea LEIMBACH "Dora", on 3 Aug 1931 in Ogden, Weber Co, UT. Clifford was born on 26 Jan 1907 in NE. He died on 10 Jun 1983 in Los Angeles Co, CA. Clifford resided in 1910 in Belvidere, Thayer Co, NE. He resided on 3 Aug 1931 in Evanston, Uinta Co, WY. He resided in Apr 1935 in 325 Main St, Evanston, Uinta Co, WY. He resided in 1940 in 325 Main St, Evanston, Uinta Co, WY. He worked as machinist - steam railroad shops in 1940. He resided in 1943 in Maywood, CA. He resided in 1948 in 4701 E 58th St, Maywood City, Los Angeles Co, CA. He was issued a social security number . He worked as machinist and diesel mechanic with Union Pacific Railroad. Clifford George GEWECKE Jr [scrapbook] 1 was born on 8 Jun 1932 in WY. He died on 8 Aug 2014. He was buried in Rose Hills Memorial Park, Whittier, Los Angeles Co, CA. Clifford resided in Apr 1935 in 325 Main St, Evanston, Uinta Co, WY. He resided in 1940 in 325 Main St, Evanston, Uinta Co, WY. He resided in 1943 in Maywood, CA. He graduated from University of Southern California. He worked as author. Clifford married Gay CAMPBELL on 16 Jun 1973 in Los Angeles Co, CA. + 7595 M ii Roger Leland GEWECKE was born on 6 Apr 1937. He died on 30 Jun 2014. 3448. Thalia A GREGORY (Mary Adine BITLER , Sylvester VanTress , Daniel , Daniel , John , Johannes ) was born on 9 Jun 1905 in OK. She died on 8 Dec 1988 in Emporia, Lyon Co, KS. Thalia resided in 1910 in 524 Chickasaw Ave, Bartlesville, Washington Co, OK. She resided in 1920 in 529 Chickasaw Ave, Bartlesville, Washington Co, OK. She resided in 1930 in Juliet Fowler Orphan Home, Dallas, Dallas Co, TX. She resided in 1935 in Dallas, Dallas Co, TX. She resided in 1940 in 525 Rural St, Emporia, Lyon Co, KS. She was issued a social security number before 1951 in KS. She resided in 1977 in Emporia, KS. She resided in Dec 1988 in Emporia, Lyon Co, KS. Thalia married Wayne Adolphus SIMPSON, son of John Brough SIMPSON and Inez Vernon HAMBLE, in 1935/1940. Wayne was born on 15 Jul 1905 in Kansas City, Wyandotte Co, KS. He died in 1964 in KS. Wayne resided in 1935 in 525 Rural St, Emporia, Lyon Co, KS. He resided in 1940 in 525 Rural St, Emporia, Lyon Co, KS. He worked as baggage clerk - steam railroad in 1940. 7598 F i Louise SIMPSON. 3452. Abbie BITLER 1, 2 (Daniel , Sylvester VanTress , Daniel , Daniel , John , Johannes ) was born on 20 Aug 1900 in KS. She died on 2 May 1990. Abbie resided in 1910 in Madison Twp, Greenwood Co, KS. She resided in 1915 in Madison Twp, Greenwood Co, KS. She resided in 1920 in Madison Twp, Greenwood Co, KS. She resided in 1922 in Madison, KS. She resided in 1930 in 748 South Volutsia St, Wichita, Sedgwick Co, KS. She was issued a social security number before 1951 in KS. She resided in 1977 in Fall River, KS. She worked as School Teacher. Abbie married Serfine John STERBENZ ""Jack"" [scrapbook] 1, son of Joseph STERBENZ and Mary Magdeline TREAR, on 16 Nov 1922 in St Joseph's Church, Olpe, KS. "Jack" was born on 20 Apr 1896 in Olpe, Lyon Co, KS. He died on 4 Sep 1982 in Wichita, Sedgwick Co, KS. He was buried in St Joseph's Cemetery, Olpe, Lyon Co, KS. "Jack" served in the military with U S Army - Private First Class in WW I. 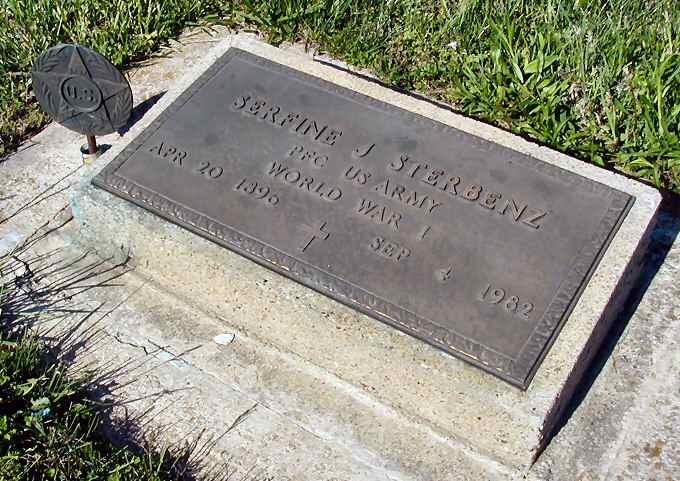 He worked as Sterbenz Garage - Owner until 1929 in Olpe, KS. He resided in 1929 in Wichita, KS. He resided in 1930 in 748 S Valentine?, Wichita, Sedgwick Co, KS. He worked as Mechanic - Stage Line in 1930. He was issued a social security number before 1951 in KS. + 7600 M i Edwin J STERBENZ was born on 24 Mar 1923. He died on 15 Dec 2002. 7601 F ii Helen STERBENZ. 7602 M iii Fred STERBENZ. Fred also married Jo Ann BRAMMER, daughter of BRAMMER and MCMULLEN. Jo was born on 6 Dec 1936 in WV. She died on 9 Dec 2002 in At Home, Johnstown, Licking Co, OH. She was buried on 12 Dec 2002 in Kingwood Memorial Park, Lewis Center, Delaware Co, OH. Jo was issued a social security number . She resides in Dec 2002 in Johnstown, Licking Co, OH. Fred also married Hazel B. + 7603 M iv Donald Leslie STERBENZ was born on 9 Feb 1930. He died on 16 Jul 1994. 3457. Phyllis I BITLER [scrapbook] 1 (Daniel , Sylvester VanTress , Daniel , Daniel , John , Johannes ) was born on 20 Jan 1916 in Madison, Greenwood Co, KS. She died on 17 Oct 2006 in Holiday Resort Care Center, Emporia, Lyon Co, KS. 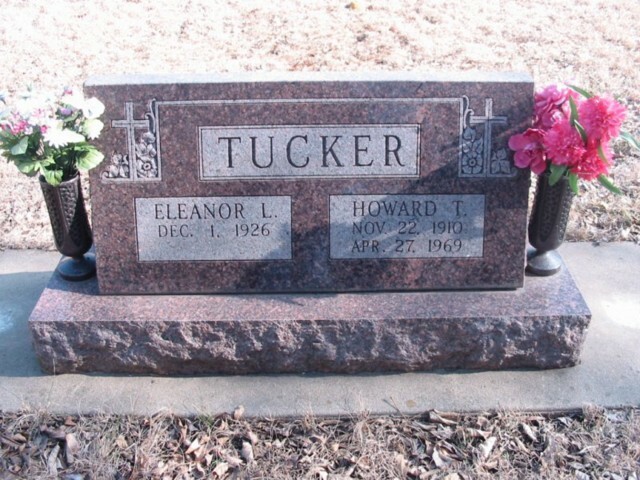 She was buried on 20 Oct 2006 in Blakely Cemetery, Madison, Greenwood Co, KS. Phyllis resided in 1920 in Madison Twp, Greenwood Co, KS. She resided in 1930 in Madison, Greenwood Co, KS. She graduated with Madison High School in 1934. She resided in 1940 in Madison, Greenwood Co, KS. She resided in 1977 in Madison, KS. She worked as Homemaker. She resided in Oct 2006 in Emporia, Lyon Co, KS. Phyllis married Alvin V STORRER [scrapbook] 1, son of Fred A STORRER and Lydia, on 26 Feb 1936 in Wichita, Sedgwick Co, KS. Alvin was born about 1912 in KS. He died on 10 Jan 1977. He was buried in Blakley Cemetery, Madison, Greenwood Co, KS. Alvin resided in 1930 in Madison Twp, Greenwood Co, KS. He resided in 1940 in Madison, Greenwood Co, KS. He worked as farm operator - farming in 1940. Karen STORRER 1 was born about 1942 in KS. She died before Oct 2006. Karen married Frederick E EGGLESTON Jr on 24 Oct 1970 in Las Vegas, Clark Co, NV. 7605 F ii Gwenda F STORRER. 7606 M iii Richard STORRER. 3458. 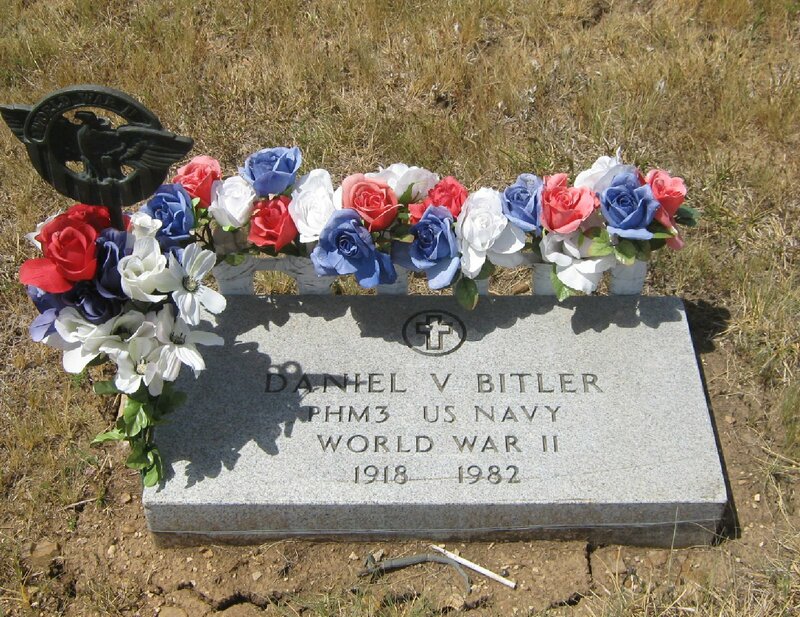 Daniel VanTress BITLER [scrapbook] 1, 2 (Daniel , Sylvester VanTress , Daniel , Daniel , John , Johannes ) was born on 8 Nov 1918 in Madison, KS. He died on 30 Mar 1982 in VA Medical Center, Topeka, Shawnee Co, KS. He was buried on 2 Apr 1982 in Blakely Cemetery, Madison, Greenwood Co, KS. Daniel resided in 1920 in Madison Twp, Greenwood Co, KS. He resided in 1930 in Madison, Greenwood Co, KS. He resided in 1935 in Greenwood Co, KS. He resided in 1940 in 205 Congress St, Emporia, Lyon Co, KS. He worked as barber in 1940. He resided in Dec 1949 in 333 Sunnyslope, Emporia, Lyon Co, KS. He resided in Dec 1949 in 321 Neosho, Emporia, Lyon Co, KS. He was issued a social security number before 1951 in KS. He resided in 1977 in Emporia, KS. He worked as Barber Shop Owner/Operator - 48 Yrs until 1981. He resided in Mar 1982 in 128 S Constitution St, Emporia, KS. He served in the military with U.S. Navy - PHM3 - Medical - Second Wave of Iwo Jima on Feb 19, 1945. in WW II. Daniel also married Anita Joyce CUADRA 1, 2, daughter of Benjamin Samuel CUADRA and Florence Katherine SILVERTHORNE, on 18 Jun 1949 in Emporia, Lyon Co, KS. Anita was born on 27 Jun 1927 in Homewood Twp, Franklin Co, KS. She died on 19 Jan 2015 in Holiday Resort Care Center, Emporia, Lyon Co, KS. Anita resided in Dec 2001 in Burlington, KS. She resided in Jan 2002 in Burlington, KS. + 7607 M i Daniel L "Dan" BITLER. 7608 M ii Lee A BITLER. Lee married Nancy J DOSS. 7609 M iii Fred D BITLER. + 7610 F iv Katherine J BITLER. + 7611 M v Gene Henry BITLER. 3460. William Earl "Earl" SHAFFER 1 (Erma BITLER , William Sawyer , Daniel , Daniel , John , Johannes ) was born on 7 Jul 1904 in At Home, W Of Madison, Greenwood Co, KS. He died on 26 May 1937 in Moundridge, McPherson Co, KS. He was buried in Blakely Cemetery, Madison, Greenwood Co, KS. Earl resided in 1930 in 302 Lincoln Ave, Madison, Greenwood Co, KS. He worked as Retail Merchant - Grocery Store in 1930. Earl married Mary Ann FRANKHAUSER 1 on 25 Dec 1923 in Emporia, Lyon Co, KS. Mary was born on 18 Sep 1900 in Madison, Greenwood Co, KS. She died on 19 Apr 1982 in West Palm Beach, Palm Beach Co, FL. She was buried in Blakely Cemetery, Madison, Greenwood Co, KS. Mary resided in 1930 in 302 Lincoln Ave, Madison, Greenwood Co, KS. + 7612 F i Mary Ardine SHAFFER was born on 16 Aug 1925. She died on 14 Jan 2003. + 7613 M ii Clayton Ethelbert SHAFFER was born on 28 Apr 1928. He died on 12 Jun 2003. 3461. Fern SHAFFER 1, 2, 3 (Erma BITLER , William Sawyer , Daniel , Daniel , John , Johannes ) was born on 14 Jan 1906 in Madison, Greenwood Co, KS. She died on 31 May 2000 in Hospital, Emporia, Lyon Co, KS. She was buried on 3 Jun 2000 in Memorial Lawn Cemetery, Emporia, KS. Fern graduated with Madison Public School in 1923 in Madison County, Greenwood Co, KS. She was a member of PEO Sisterhood - 61 Yrs. She was a member of 1st United Methodist Church - Member. She resided in Jun 1940 in Cottonwood Falls, Chase Co, KS. She was issued a social security number before 1951 in KS. She resided in Feb 1969 in Cottonwood Falls, Chase Co, KS. She resided in May 1983 in Emporia, KS. Fern married George L IMTHURN 1, 2, 3, son of Henry IMTHURN and Mary FRANKHAUSER, on 24 Jun 1925 in Madison, Greenwood Co, KS. George was born on 28 Jan 1902 in KS. He died on 6 Oct 1988 in Emporia, Lyon Co, KS. George resided in 1910 in Madison Twp, Greenwood Co, KS. He resided in Jun 1940 in Cottonwood Falls, Chase Co, KS. He worked as Gasoline Tank Wagon Operator - 25 Yrs in Jun 1940 in Cottonwood Falls, Chase Co, KS. He was issued a social security number before 1951 in OK. He resided in Feb 1969 in Cottonwood Falls, Chase Co, KS. He resided in May 1983 in Emporia, KS. He resided in Oct 1988 in Emporia, Lyon Co, KS. He resided in Mar 2004 in Emporia, KS. + 7614 F i Ione IMTHURN was born on 24 Sep 1929. She died on 26 Feb 2004. + 7615 F ii Maxine IMTHURN. 3468. Etta L SOULE 1, 2, 3 (Ralph Lional SOULE , Susanna BITLER , Daniel , Daniel , John , Johannes ) was born on 28 Feb 1911 in Fossil, Lincoln Co, WY. She died on 10 Dec 2004 in Tipton Oak Manor Nursing Home, Tipton, Moniteau Co, MO. She was buried on 14 Dec 2004 in Number Eight Cemetery, Madison, Lyon Co, KS. Etta resided in 1920 in Fossil Twp, Lincoln Co, WY. She resided in 1930 in 106 Sage St, Kemmerer, Lincoln Co, WY. She graduated with High School in Fossil, Lincoln Co, WY. She was issued a social security number before 1951 in NY. She worked as Teacher. She resided in 1998 in Hughesville, MO. She was a member of Hughesville Baptish Church - Member, Sunday School Teacher. She resided in Oct 2004 in Tipton, Moniteau Co, MO. She resided in Dec 2004 in Hughesville, Pettis Co, MO 65334. Etta married Guy F GRAVATT 1, 2, 3 on 12 May 1933 in St Charles, St Charles Co, MO. Guy died in Jul 1967. + 7616 M i Rev Carl A GRAVATT. 7617 F ii Rita E GRAVATT. Rita married Peter L PETERSON. + 7618 F iii Valerie GRAVATT. 3469. Freeman G SOULE Sr 1, 2 (Ralph Lional SOULE , Susanna BITLER , Daniel , Daniel , John , Johannes ) was born on 4 Jul 1914 in Fossil, WY. He died on 5 Dec 1998 in Emporia, KS. He was buried on 9 Dec 1998 in Blakely Cemetery, Madison, KS. Freeman worked as Electrician. He resided in 1920 in Fossil Twp, Lincoln Co, WY. He resided in 1930 in 106 Sage St, Kemmerer, Lincoln Co, WY. He resided from 1933 to 1974 in Northport, Long Island, NY. He was issued a social security number before 1951 in NY. He resided from 1974 to 1998 in Madison, Greenwood Co, KS. He was a member of Methodist in United Methodist Church, Madison, Greenwood Co, KS. He resided in 1998 in Madison, Greenwood Co, KS. Freeman married Rosemond Mercedes SHANKS 1, 2, daughter of Finis Melburn SHANKS and Abigail TOWNSEND, on 21 Oct 1933 in Emporia, KS. Rosemond was born on 17 Dec 1914. She died on 5 May 1987 in Madison, Greenwood, KS. Rosemond resided from 1933 to 1974 in Northport, Long Island, NY. She was issued a social security number before 1951 in NY. She resided from 1974 to 1987 in Madison, Greenwood Co, KS. Roger G SOULE 1 was born on 21 Feb 1935. He died on 25 Feb 2003 in Palm Desert, Riverside Co, CA. Roger was issued a social security number before 1951 in KS. He resided in 1998 in California. He resided in 2003 in Palm Desert, Riverside Co, CA. Joan SOULE 1 was born on 3 Jan 1937. She died in Oct 1973. Joan was issued a social security number in 1952 in CA. Infant SOULE was born in 1939. Infant died in 1939. + 7622 F iv Linda Lee SOULE was born on 1 Dec 1939. She died on 8 Jun 1997. 7623 M v Kenneth S SOULE. 7624 M vi Freeman G SOULE Jr.
7625 M vii Ernest A SOULE. 7626 M viii Shawn BOWEN. 3473. Freeman Roy "Roy" SOULE 1 (Freeman Wilbur SOULE , Susanna BITLER , Daniel , Daniel , John , Johannes ) was born about 1903 in Kansas. He died on 12 Jan 1978 in Emporia, KS. Roy resided in 1910 in Prospect Twp, Butler Co, KS. He resided in Sep 1918 in Pontiac, Butler Co, KS. He resided in 1920 in Prospect Twp, Butler Co, KS. He worked as Mechanic - Auto Repairing At Home in 1920. He resided in 1930 in 1107 West Fifth St, Emporia, Lyon Co, KS. He worked as Machinist - Garage in 1930. Roy married Mary Frances MATHER 1, 2, daughter of George Thomas MATHER and Hattie HENSON, on 31 Jul 1926 in Kansas City, MO. Mary was born on 13 Jul 1908 in Topeka, KS. She died on 22 Sep 2001 in Arkansas City, KS. She was buried on 27 Sep 2001 in Maplewood Memorial Lawn Cemetery, Emporia, KS. Mary resided in 1930 in 1107 West Fifth St, Emporia, Lyon Co, KS. She resided in Jul 1988 in Emporia, Lyon Co, KS. She resided before 2001 in Emporia, Lyon Co, KS. She resided in 2001 in Arkansas City, KS. She worked as Homemaker. She worked as Housemother (5yrs) in Sigma Sigma Sigma Sorority, Emporia State Univ. She was a member of Miriam Chapter No 14 Order of the Eastern Star in Emporia, KS. She was a member of Ball-CMcColm American Legion Post No 5 Auxilliary in Emporia, KS. She was a member of Flint Hills Christian Church in Emporia, KS. + 7627 F i Dorothy E SOULE was born in May 1921. She died on 24 Jul 1988. + 7628 M ii Roy L SOULE was born on 21 Nov 1930. He died on 24 Jan 2002. 3476. Eleanor L SOULE 1, 2 (Freeman Wilbur SOULE , Susanna BITLER , Daniel , Daniel , John , Johannes ) was born on 1 Dec 1926 in Rosalia, Butler Co, KS. She died on 29 May 2013 in Butler Co, KS. She was buried in Economy Cemetery, Prospect Twp, Butler Co, KS. Eleanor resided in Dec 1926 in Rosalia Twp, Butler Co, KS. She resided in 1930 in Eureka Twp, Greenwood Co, KS. She resided in 1940 in 121 W Pine St, Eureka, Greenwood Co, KS. She worked with Otasco. She worked as Clerk of the District Court (20+ years) with Greenwood County. She resided in Jul 1994 in Eureka, Greenwood Co, KS. Eleanor married Howard Thurman TUCKER [scrapbook] 1 on 29 Jan 1947 in Yates Center, Woodson Co, KS. Howard was born on 22 Nov 1910 in Greenwood Co, KS. He died on 27 Apr 1969. He was buried in Economy Cemetery, Butler Co, KS. Howard was issued a social security number in Feb 1951 in KS. + 7629 F i Linda M TUCKER. 7630 F ii Margaret A TUCKER. Margaret also married [Male] HULL. + 7631 M iii David L TUCKER. Eleanor also married Louis JACOBY "Jake" 1, 2. Jake died before 2013. 3477. Phyllis Ann SOULE 1, 2, 3, 4, 5 (Freeman Wilbur SOULE , Susanna BITLER , Daniel , Daniel , John , Johannes ) was born on 10 Jun 1928 in Rosalia, Butler Co, KS. She died on 27 May 2009 in St. Luke Living Center, Marion, Marion Co, KS. She was buried on 30 May 2009 in Economy Cemetery, Butler Co, KS. Phyllis resided in 1930 in Eureka Twp, Greenwood Co, KS. She resided in 1940 in 121 W Pine St, Eureka, Greenwood Co, KS. She resided in Jul 1994 in Marion, Marion Co, KS. She resided in Dec 1995 in Marion, Marion Co, KS. She was a member of Girl Scouts of America. Phyllis married D Eugene ENOS on 9 Aug 1953 in 1st Methodist Church, Emporia, Lyon Co, KS. 7632 F i Kristi ENOS. 7633 M ii Daryl ENOS. 7634 F iii Debra K ENOS. Debra married Mark W HEIDEBRECHT. + 7635 F iv Teresa ENOS. 7636 F v Kelly ENOS.